Analysis: Culkin caught his first career pass, but for the most part it was a disappointing season for the second-year tight end. While it's unclear if Antonio Gates will return to the team, Hunter Henry (knee) should be back in 2019 and the continued presence of Virgil Green will likely hinder Culkin's opportunities to receive consistent looks. Analysis: Culkin sat out the last four games due to a lingering back injury, but will retake the field versus Denver. The second-year tight end will serve a depth role behind Antonio Gates and Virgil Green. Analysis: Culkin practiced in a limited capacity each day this week. The Missouri product is in danger of missing his fourth consecutive game Sunday due to a lingering back injury. If Culkin misses Sunday's game, the Los Angeles offense likely wouldn't be impacted much. Analysis: Culkin will miss his third straight game due to a lingering back injury. The second-year tight end has only been targeted once this season and hasn't seen more than 20 offensive snaps since Week 6, so his continued absence is unlikely to notably impact the Chargers' offense. Culkin (back) has been ruled out for Thursday's matchup against the Chiefs. Analysis: Culkin was unable to practice each day this week. The Missouri product also missed Sunday's win over the Bengals. Culkin hasn't logged more than 20 offensive snaps in a game since Week 6 and is listed as the third tight end on the depth chart. Therefore, his absence may not have much of an impact on the team. Culkin (back) did not practice Tuesday, Sam Fortier of The Athletic reports. Analysis: Culkin's absence from the practice field doesn't bode well for his chances of suiting up in Saturday's tilt with the Jets. Given the short week, Culkin may need to prove he can hold up in practice before earning any green light. If he can't go, the Chargers would be left with just two active tight ends for Saturday's contest. Culkin (back) was a non-participant on Monday's practice report. Analysis: Culkin did not participate in practice last week, and while Monday's status is an estimation -- given the team had a walk-through -- it's not encouraging to see Culkin as a DNP once again. However, as a blocking specialist, Culkin doesn't see a ton of targets when on the field and carries little fantasy value. Culkin (back) is inactive for Sunday's game against the Bengals. 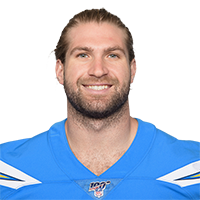 Analysis: A depth tight end for the Chargers, Culkin has one reception through the team's first 12 games. His absence thus won't prove too consequential for fantasy purposes. Culkin (back) is doubtful for Sunday's game against the Bengals, Eric D. Williams of ESPN.com reports. Analysis: Culkin did not practice Wednesday or Thursday due to a back injury, putting his status for Sunday's tilt against the Bengals in legitimate question. The depth tight end has only caught one pass this season, so his absence would likely only lead to an uptick in blocking snaps for Virgil Green. Culkin did not practice Wednesday due to an apparent back injury, Sam Fortier of The Athletic reports. Analysis: It's a little unclear as to when Culkin sustained the back injury. With little details provided, it's tough to estimate his availability for Sunday's contest. His practice report over the next two days should give a better indication. Culkin earned a spot on the team's 53-man roster, Jack Wang of the Los Angeles Daily News reports. Analysis: The return of Antonio Gates likely means that Culkin will be primarily a special teams player. The second-year tight end is firmly behind Gates and Virgil Green on the depth chart. 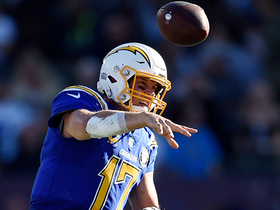 Los Angeles Chargers quarterback Philip Rivers launches it to tight end Sean Culkin for a 24-yard gain.